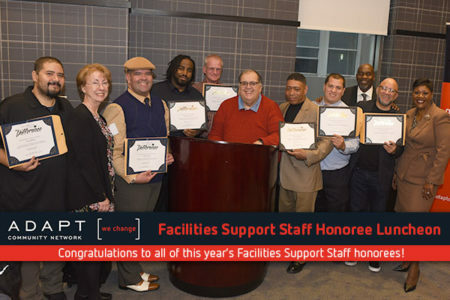 Each year, ADAPT Community Network honors its DSP and Facilities Support staff for their contributions to the agency and the disability field. This year, for the first time, ADAPT held an individual luncheon for both DSP and Facilities Support staff in honor of their dedication to this work. On November 2, ADAPT recognized the following eight Facilities employees at a special luncheon: Martin Nunez (2432 Grand Concourse), Paul Lindsay (80 West End Avenue), Donald Patterson (80 Maiden Lane), David Diaz (281 Port Richmond Avenue), Daniel Sullivan (121 Sullivan Avenue), Marco Macancela (Forest Hills West School), Jose Molina (Wm O’Connor School Midwood) and Camilo Grau (Gramercy School). The presentation of the awards was delivered by Jackie Conley, Senior Vice President of Program Development and Facilities, Ken Pratt, Vice President of Administration, and Ann Esposito, Interim Director of NYL Schools. Congratulations to all the honorees of 2018!